]There are other threads discussing this, but I thought a dedicated thread with instructions might help others. I have received so much help here that it is payback time, finally, with me posting info that may help others (versus the other way around). I did this last night in my MKS, and I have a 3 out of 10 skill level. The whole procedure took me about 15 minutes thanks to tips from others on this forum (particularly Jack Skellington and crash712us ). The symptoms: Clicking/tapping noise coming from the dash area near the passenger side when the car is on and the climate control system is on. The Part: Door blend actuator (part number: AA5Z-19E616-C) . I got mine on ebay for $19.00 shipped. 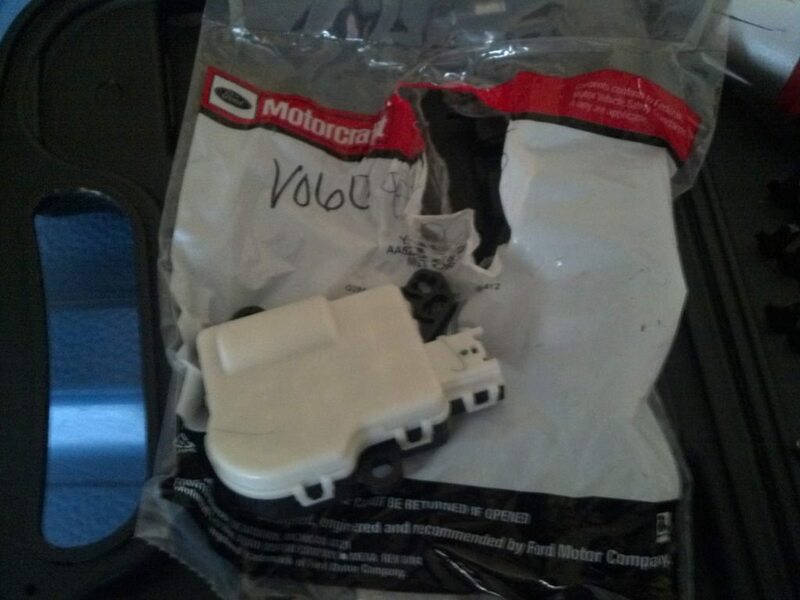 It is a genuine Motocraft part. Here is the link to the part and a photo I took of the part. You will clearly see the white part. There are 2 clearly visible hexagon head screws holding it in. Remove them. Then, undo the electrical clip fastener. The part will now be free from the car. 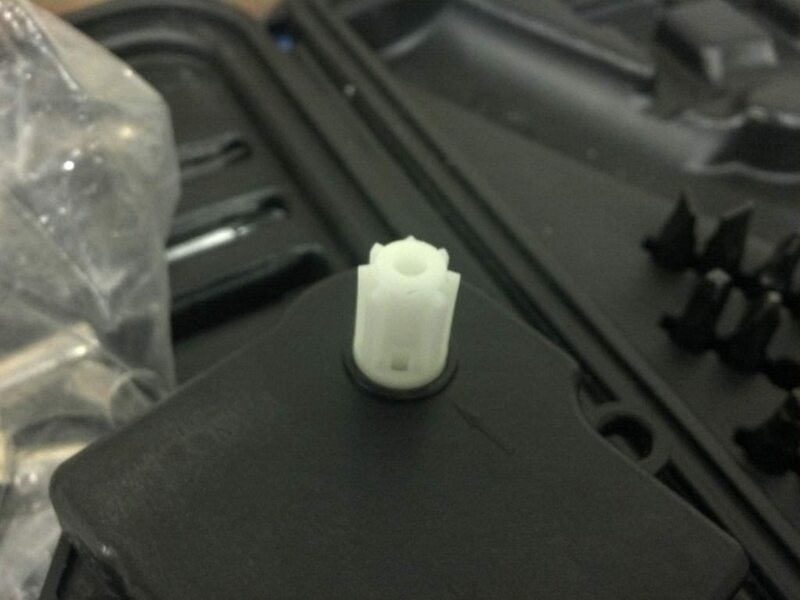 Connect the electrical connector to the new part and try to insert the white gear shaft (attached to the rear of the actuator part) into the opening in the car to re-secure the part, using the 2 hex head screws, to the car. In my case, the gear shaft was not properly lined up. You will note from the photo below, there is a small flat area on the gear shaft - it is not perfectly symmetrical, so it can only go in one way. If it does not line up, start the car and fiddle with the temperature control (hot/cold) , as that will turn the gear shaft clockwise and counter clockwise. Play with it until it is in the right position to insert with the 2 hex head screws lining up. This is very easy, but takes a minute or two to fiddle with to line it up. See non-symmetrical gear shaft below - the "flat" area is facing you. Once it is lines up, inserted, and the screws are back in, simply put the glove box back into position and re-insert the two rubber bumpers/stoppers. And, you are DONE!!! $19.00 and 15 minutes or less with nothing more than a hex head driver saves you a trip to the dealer. P.S. If you have not changed yourecabin air filter in a while, You might want to do that before re-securing the glovebox, since the filter door is completely accessible. 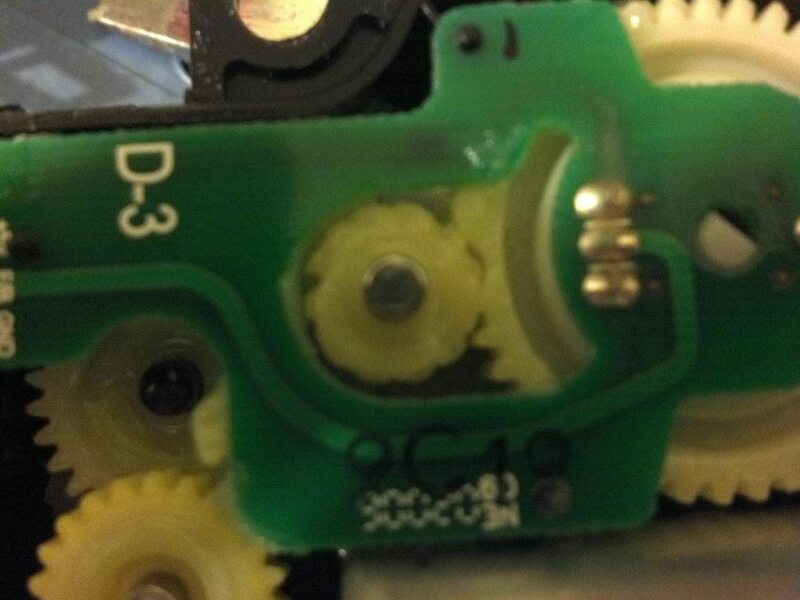 I opened up the broken actuator and the photo is below. You can see some inner gears are work down and broken in the center of the photograph. Hope all of this helps a fellow member! please use my website for any price quotes and to submit any orders. Please email me via info@ecopowerparts.com if you have any questions on new or existing orders, PM's via the forum are hard to track your purchase as I can't relate user name to actual name. Thanks for copying this over for me Mike! Hope folks find it useful. Mine has been doing this for about 3 months, but so far I still have A/C. Will get the part and fix! Used your link and ordered part. Comes from Tasca - free shipping. 2008 White G8 GT - mods... 8.32 1/8 mi. Bob has decided not to post here any more, please do not PM him he will not receive it. Yeah, I never had any failure (like A/C not working), just the annoying clicking/knocking. If you have any questions when installing it, shoot me a PM! Hopefully it won't be as hard as when I had the dash apart and screen out. You know, I haven't heard of anyone having problems with the blend door on the driver's side...I take it that one may be harder to access and change? So... It's a piece of cake! I found in changing three of the four, that the passenger side (note to the left of the easily accessible white one) is by far the worse one to access. You can see the lower fastener bolt head in the photo. I took a few breaks during the install as to not damage other parts of the car or myself lol. I got the Blend Door Actuator from Tasca this AM. Grabbed a bunch of tools an proceeded to vehicle. Dropped Glove Box Door by pushing in on both sides. Presto!!! everything fell on the floor, just like I planned. Then I turned on Flex and got the blend door actuator to click, and could feel that it was slipping. Next... I realized I had all the wrong tools to remove it.... BUT I did have my trusty little socket set on the floor that had been in the glove box, that I used to remove MCT sensor and most other under hood parts. Grabbed the correct socket the first time and had it out in about 10 seconds. Popped in the new one and attached it with 2 bolts/screws I removed. 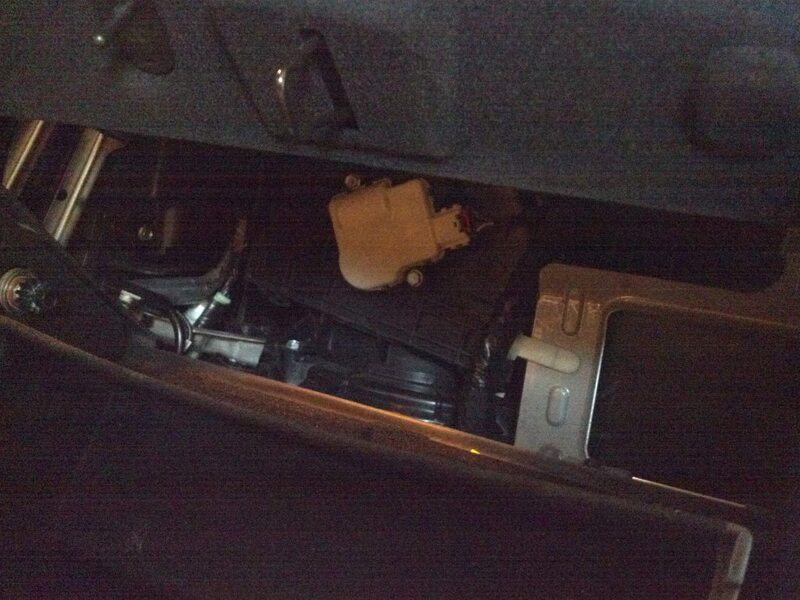 Plugged it in and replaced glove box and everything in it. That actually took more time than replacing the blend door. Once repaired, I proceeded to test it!!! I always do it this way, so I have a 50% chance of having to re-do what I did!!!! But disappointingly, it worked, so I was almost done. Went back inside and put away all the tools I didn't need (had all tools already in Flex!) and then proceeded to take the old actuator apart. The same big gear as shown in pix above was missing 1 tooth. If I were doing this again, I could do it in my sleep in about 2 minutes or less! Very easy and no access issues! anyone know what to call this gear that slows down the glovebox door when you open it? I'm looking for a part number or assembly. Trap Speed of almost 116 mph. My HVAC system "Clicks" once, loudly, every time the system is turned on and then again when it is turned off. Sounds like the recirculation actuator motor. Is there a fix for that too? It could also be your door blend actuator making the click sound when turning on and off,relativly a cheap and easy part to install,while you have the glove box open install a new cabin filter.